The Royal Canadian Naval Air Station (H.M .C.S . Shearwater) near Dartmouth, Nova Scotia, has taken delivery of thirty McDonnell F2H-3 Banshee all-weather, single-seat strike-fighters. The first R.C.N. jet fighter squadron, VF-870, is now equipped with the F2H-3s preparatory to serving in the new R.C. N. Carrier Bonaventure which will be completed before the end of the year. Unlike the Fleet Air Arm, which has discontinued tail markings. the R.C.N. retains red, white and blue fin flashes. McDONNELL F2H-3 BANSHEE. Data : Manufacturer : McDonnell Aircraft Corp., St. Louis, Missouri. Power: two J-34-WE-34 turbojets of 3,250-lb. thrust each. Accommodation: single-seater. Dimensions : span 44 ft . 11 in . ; length 47 ft. 6 in. ; height 14 ft . 5 in. Weights : gross weight over 19.000 lb. Performance: maximum speed 600 m.p.h. ; cruising at altitude over 500 m.p.h. ; initial rate of climb 9,000 ft ./min. ; service ceiling above 50,000 ft.; maximum range 2,000 miles with tip tanks. Taking off for the first time is the North American F-100D. latest in the supersonic series of Air Force fighters. An autopilot and other improvements have been added. New colour schemes are being applied to U.S. Navy aircraft. Some training PBM-5 Mariners (of ATU-501, NAS Corpus Christi) are getting white top deckings, while this photograph shows the second prototype XP6M-1 Sea Master with white undersides to wings and single-step hull. Upper surfaces remain "Midnite" blue. The two men beside the hull give an idea of the size of the Martin Sea Master. A six-seat military utility transport in the de Havilland Beaver class, the Max Holste 1521 is now in production for the French Air Force. The first twenty-seven M.H .1521s will be completed by the end of 1956. Powered by a 450-h .p. Pratt & Whitney Wasp R-985-ANI radial, the Broussard has a maximum speed of 168 m.p.h. and a range of 745 miles. Span is 51 ft. 7 3/4 in. and length 28 ft. 2 1/2 in. Photograph shows the prototype, M.H.1521-01, "Z". The new Republic jet muffler for F-84Fs. The Paul Mantz Fokker D VII with correct German markings. 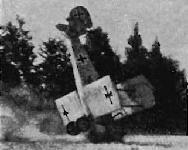 The patee crosses are clearly marked on this faked German machine, used in many Hollywood World War I Films including "Hell's Angels". 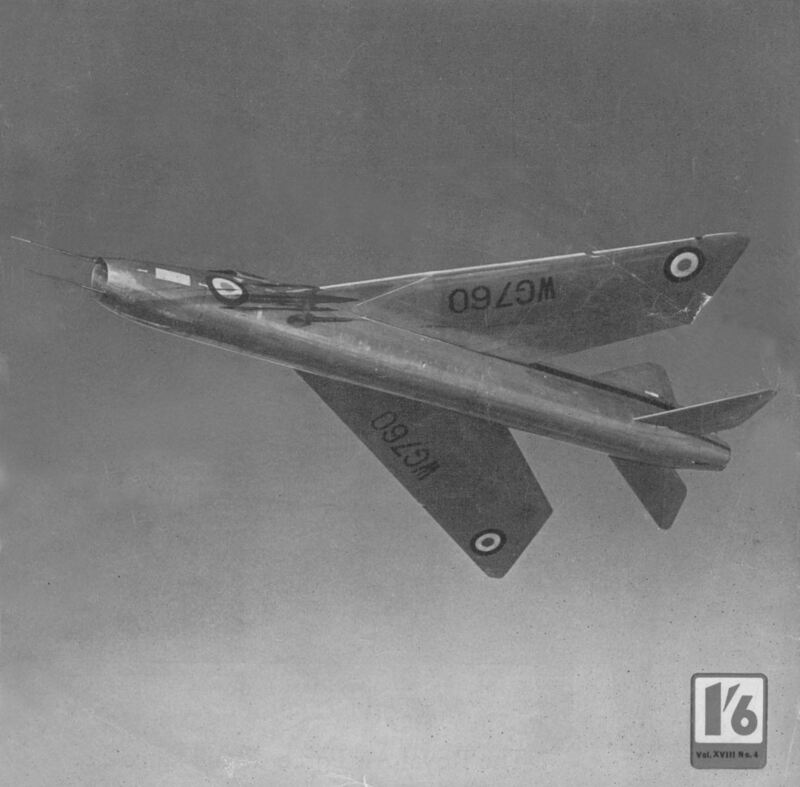 First photograph to be released of the revised Mark 5 version of the Avro CF-100 which has been developed as a high-altitude photographic reconnaissance version of the CF-100 Mk. 4 two-seat all-weather fighter of the R.C.A.F. The Mark 5, now in production at Malton, Ont., will also be used as a high-altitude interceptor, the armament being six Hughes F-98 Falcon homing missiles under each wing. Major differences to the earlier marks are in shape and powerplant. Both wings and tailplane are of increased span, the area being tacked on to the tips. The extra wing area appears to be of constant chord. The later Mark 14 Orenda axials (a.s in Canadair Sabre Mk. 6) has been substituted in place of the earlier Orenda Mk. IIs, although there is no increase in the rated power of 7,000-lb. s.t. 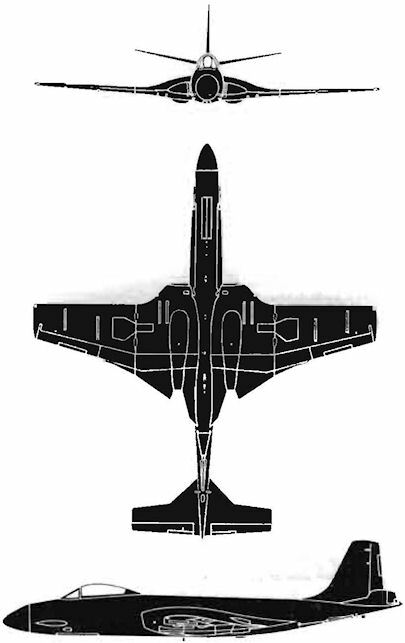 The increased wing and tailplane spans extend from outboard of the normal Mark 4s leading-edge Goodrich de-icing boots which appear as thick dark lines in the photograph. English Electric P.1А, разработанный в соответствии с той же спецификацией, что и F.D.2, в дальнейшем превратился в истребитель Lightning. Но, несмотря на то, что P.1A и Lightning были очень скоростными, они никогда не использовались для установления мировых рекордов скорости. 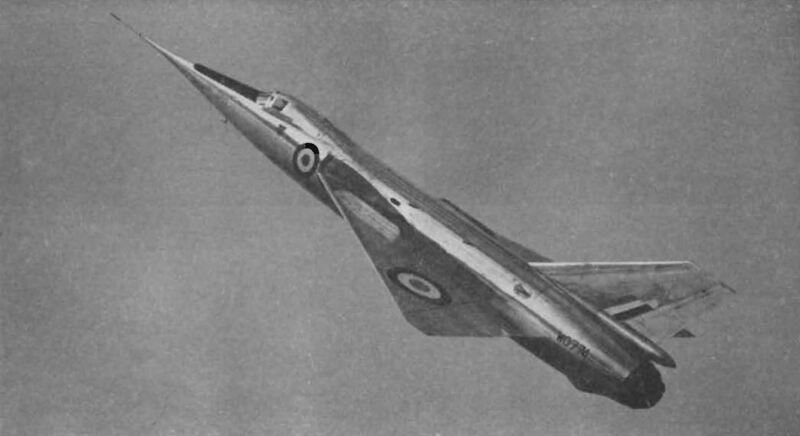 Although the English Electric P.1 (P for Pursuit) was first flown by W/C Roland Beamont at Warton, Lancashire, on 4th August 1954, air-to-air photographs (including this one) have been restricted for the past eighteen months. Five prototypes and twenty pre-production P.1As are on order. Power is two 8,000-lb. S.t. Armstrong-Siddeley Sapphire axials. All other data is restricted. WG160 is the first prototype. This photograph shows the Tiger Moth By J. M. G. Gradidge before the registration was altered. Switching from tandem to side-by-side seating, the U.S.A.F. has, with the twin-jet Cessna T-37A, the first of a new series of intermediate jet trainers. The Cessna Model 318 has a maximum speed in excess of 400 m.p.h. and an a.u.w. of 5.600 lb. The photograph shows clearly the lightweight ejection seats and the root intake to the starboard 920-lb. s.t. Continental J69-T-15 (licence-built French Turbomeca Marbore II). Rubber de-icing boots on the in take are new, as are the revised aileron and flap shapes. Most noticeable changes from the prototype (U.S.A.F. 54-716) are the additional "keel" bumper and the larger fin and rudder, which are now more square-cut. The forward fin fairing is now straight-edged and of increased area. The dark (red) band immediately behind the canopy indicates the separation point for rear fuselage removal during overhauls. The T-37A is in production at Wichita, Kansas. Fifteen pre-production models are now entering service. Span 33 ft.; length 27 ft. 1 in. ; initial rate of climb 3,000 ft.p .m. ; range 935 miles; cruising speed 310 m.p.h. (N.B. : Sharp eyes may detect the shadow of a swept-wing fighter which has attracted the attention of the pilot. Look for the shadow under the nose of the T-37A, almost under the "AIR" of U.S. Air Force. В конце 1947 года английское Министерство снабжения, наконец, признало, что Великобритания утеряла лидерство в разработке сверхзвуковых самолетов, и составило экспериментальную "спецификацию W3" на новый опытный самолет. Компания "Fairey" ответила созданием усовершенствованного Delta Two или F. D.2. Climbing at an angle of 45 degrees, the first prototype Fairey Delta 2 (WG774) is flown by Lt.-Commander Peter Twiss, D.S.C., prior to the successful attempt on the world 's speed record on 10th March, when Twiss established the F.A.1. record of 1,132 m.p.h. (1,822 Ikm./hr.) over a nine-mile course between Chichester and Ford, Sussex. Two runs were made, the first (east to west) was covered at 1.117 m.p.h. (1,798 km./hr.) and the second (west to east) at 1,147 m.p.h. (1.846 km./hr. ), thus exceeding by 37 per cent the existing record of 824 m.p.h. 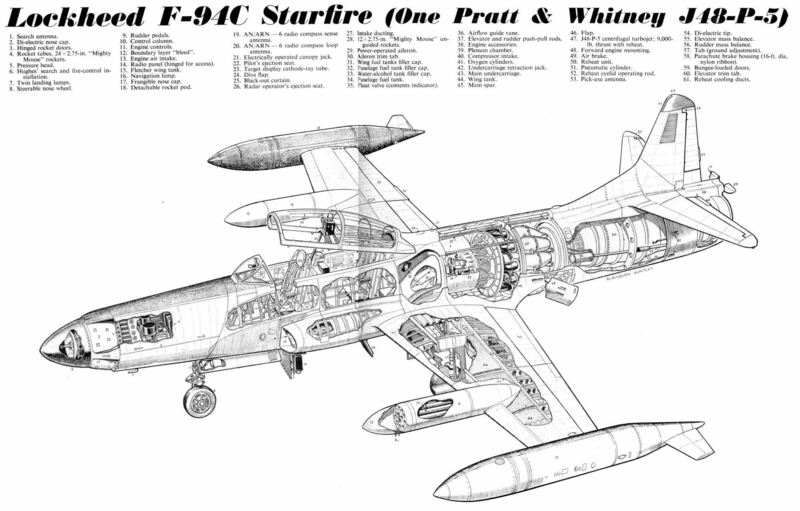 set up by Col. Horace A. Hanes in an F-100A Super Sabre on 20th August 1955. The Delta 2, powered by a 10,000-lb.s.t. Rolls-Royce (re-heat) Avon, undertook the record runs at an altitude of 7 1/4 miles (38,000 ft.) after taking off from A. & A.E .E., Boscombe Down, Hampshire. The span of the FD-2 is 26 ft. and the length 52 ft. 3 in. First flight was on 6th October 1954. BEECHCRAFT MODEL 73. A direct conversion of the Beech Mentor, as was the jet Provost of the standard Provost, the Model 73 has been offered for sale as a basic trainer anywhere in the free world . At present one of its limiting factors seems to be high price. Major differences in the Model 73 from the Mentor (apart from engine) are a full, clear-view hood with rounded windscreen, built-up rear fuselage to house the jet pipe, bulged wing roots for the intakes, and an increase in the size of the dorsal spine. So far the Model 73 is a purely private venture as is shown by its civil markings. Salient features : A low-wing all-metal monoplane, the Model 73 has smooth lines accentuated by the long, clear canopy which is reinforced at the back. The nose forward of the cockpit is short and blunt. Wings have maximum taper on the trailing edge, blunt tips and long, narrow intakes at the bulged roots. Dihedral is from the roots. The fin is tall and square-cut with a prominent dorsal spine, while the rectangular tailplane is set on the fuselage top line. The nosewheel retracts backwards and the mainwheels inwards. BEECHCRAFT MODEL 73. Data: Manufacturer : Beech Aircraft Corp.. Wichita, Kansas . Power: one Continental J-69-T-9 turbojet (licence-built Marbore) of 880-Ib. thrust . Accommodation: two seats in tandem. Dimensions : span 32 ft. 9 in . ; length 30 ft. 1 in. ; height 9 ft. 11 in. Weights: all-up 4,521 lb. Performance: maximum speed 291 m.p.h. at 15,000 ft.; stalling speed 69 m.p.h. The prototype Model 240 had a new lease or life by becoming the flying test-bed ror the 2,925-e.s.h.p. Allison Model 501s (YT38s - predecessors or the YT56-A-3s which power two M.A.T.S. Convair YC-131C Samaritans). Renamed the TurboLiner, N24501 flew at San Diego on 29th December, 1950, to become the first U.S. turboprop transport aircraft, cruising at 310 m.p.h. with an a.u.w. or 41,790 lb. S.N.C.A. du Sud-Est Armagnac with two jet nacelles under the fuselage. Note the white anti-corrosion paint under the rear belly as a protection against the efflux combustion products. ARMSTRONG WHITWORTH A.W.17 ARIES. Another lesser-known British military prototype of the late 1920s is the Armstrong Whitworth A.W.17 Aries, a two-seat Army Cooperation general-purpose biplane. Fortunately a general arrangement drawing. prepared for the Air Ministry and traced on 15th April 1929. survived the war-time bombing of A.W.A. 's Coventry offices. The only noticeable difference between the drawing and the actual 1929 prototype J9037 is a Townend ring cowling over the 460-h.p. Armstrong Siddeley (special geared) Jaguar IV. Only one prototype was built. Tested in 1930, the Aries Mk. I was virtually a twin of the more successful Type 137 Atlas Mks. I and II which served with the R.A.F. ARMSTRONG WHITWORTH A.W.17 ARIES. Data: Manufacturer: Sir W. G. Armstrong Whitworth Aircraft. Ltd., Coventry, Warwickshire, England. Design No. and name: A.W.17 (Type 130 of September 1927) Aries Mk.1. Powerplant: One 460-h.p. Armstrong Siddeley (special geared) Jaguar IV air-cooled radial driving a 10 ft. 6 in. diameter fixed-pitch, wooden airscrew at 2,200 r.p.m. (max.) and 2,000 r.p .m. (normal). 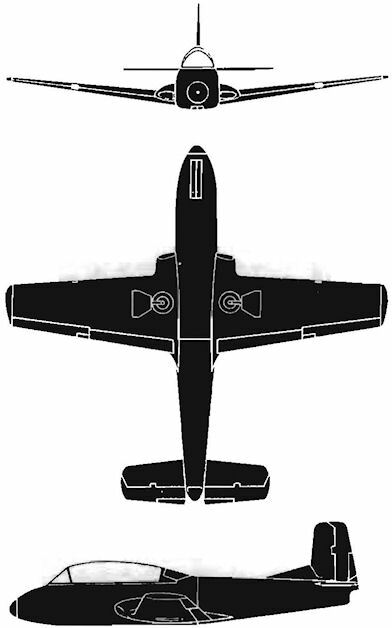 Dimensions: main-plane. upper 42 ft. 0 in., chord 6 ft. 7 in., lower 28 ft. II in., chord 5 ft. 7 in . ; mainplane gap 5 ft. 7t in . ; length 28 ft. 4t in. : height 10 ft. 11 in. Total areas: wings 399.4 sq . ft.; ailerons 44 sq. ft.; tailplane 50.9 sq. ft. (volume coefficient 0.301); elevator 19.1 sq. ft.; rudder 20.75 sq. ft. (volume coefficient 0.045). Mainwheel track 7 ft. 2 1/4 in . Tankage : petrol 75 Imp. gal. ; oil 7 Imp. gal. Loadings: power 9.25 Ib ./ h.p. ; wing 10.6 Ib ./sq. ft. Other details including performance are not available in the manufacturer's files. POLISH C.S.S. 12. Design work on Poland's second post-war feeder-liner began in Warsaw in 1948 under the general direction of Prof. F. Misztal, a pre-war member of the P.Z.L. design staff. Two years later the ten-passenger C.S.S. 12 (SP-BAR) began a series of test flights which continued on into 1951. Prof. Misztal was also responsible for the two earlier phases of the C.S.S. programme, namely the design and manufacture of primary trainer and aerobatic prototypes. This resulted in the C.S.S. 10A (1948) and the C.S.S. 10C (1949) primaries and the C.S.S. 11. 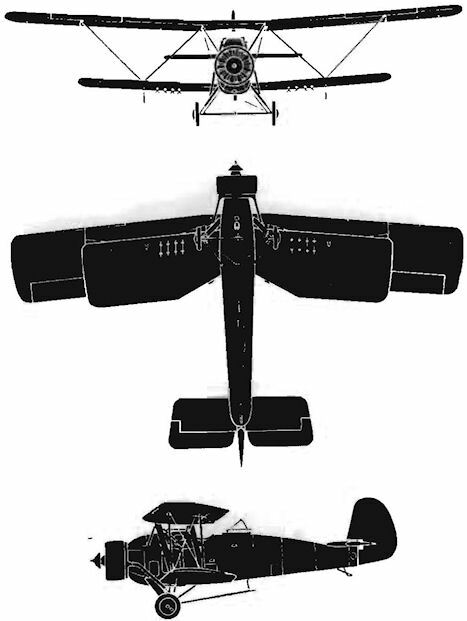 Salient features: In the same class as the French Sud-Ouest SO.94R and tailwheel SO.95 Corse 11 (and using ·the same basic Argus 12-cylinder inverted-vee inline "power eggs " ), the C.S.S. 12 bears a superficial resemblance to the smaller and lighter D.H.104 Dove/Devon series of feeder-liners. 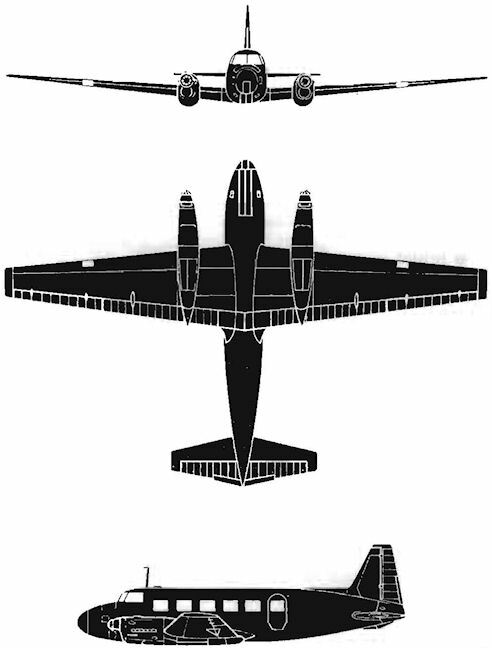 The unusual plan-view shape of the nacelles is due to the forward and sideways (through 90 degrees) retracting main undercarriage legs which, like the backwards-retracting nosewheel, and the double-slotted, camber-changing flaps are hydraulically operated. POLISH C.S.S. 12. Data: Manufacturer: Centralne Stadium Samolotow of Z.P.L. (United Aircraft Industry), Warsaw, Poland. Powerplant: two 580-h .p. (390 h.p. at cruising altitude of 8.500 ft .) Argus As 411 TA air-cooled inlines. Accommodation : ten plus two crew. Dimensions: span 60 ft. 8t in. ; length 41 ft.; height 16 ft . 9 1/4 in. ; wing area 431.636 sq . ft.; assect ration 8.53 . Weights: empty 7.717.5 lb. ; payload 2.205 lb. : loaded 12,127.5Ib . Performance : maximum speed (at approximately 8,000 ft .) 226.67 m.p.h. ; cruising speed (at 2/3rds t.O. power) 198.72 m.p.h. at 8.500 ft.; minimum speed 62.1 m.p.h. ; climb rate (maximum a.u.w.) 1,280 ft./min. ; service ceiling 19,692 ft .; range 745 miles.